Ron had spoken beforehand of defensive solidity and some had wondered whether we might see Yoshida at right back again - Yoshi’s best right back performance for Saints had probably been against these same opponents in the cup a few weeks earlier, but Cédric kept his place, while it was also a relief to see Fonte back in the team. When the game begins, Saints start like they are on fire, first Tadić firing over from inside the box, then he sets up Pellè who also wastefully shoots over. It’s a great opening response to put memories of Wednesday properly behind Saints, although really both chances should have been finished with more composure. The pattern of pressure continues throughout the opening period, Villa looking chronically low on confidence and completely incapable of escaping the Saints pressure, continually giving the ball away with errors both forced and unforced. Saints create further chances, Mané chesting down a cross to make space for a shot that goes the same way as the previous efforts. Then Saints get one on target at last as Fonte pokes at goal from a fumbled corner, only to see it cleared off the line. The resulting corner should have been put in by Mané at the far post. Twenty minutes in and Saints have already had enough chances to have won the match by now. Villa try to regain some composure and put together some spells of possession, but can’t create anything as they don’t really have the guile in them to break down the well organised Saints team. Saints themselves show much more movement when they have the ball, but the next chance falls to Gestede who takes a complete airshot with what was among the clearest opportunities of the game so far, it’s a let off for Saints who should have been punished for their earlier misses. Still the wasted chances come for Saints, who are finding Villa very timid down the flanks and continue to make space to get in crosses, Lescott misjudging one from Mané, but Pellè is unable to get power behind his header. However, as time goes on Villa manage to steady the ship a little, and after the torrid first 20 minutes are able to frustrate Saints more and more as the half goes on. Tadić and Mané had caused havoc early on, but begin to be denied that space. Then the sucker punch comes along, a corner skidded in flies across the face of goal and is tapped in by Lescott unmarked. It’s a sloppy goal to concede after a sloppy half where Saints had been by far the better team, but lacked a clinical finish. The second half begins with a similar pattern to the first. Saints dominant, but possibly due to a lack of confidence from the recent defeats show a lack of decisiveness in front of goal, compared with when playing in our best form. Villa meanwhile, with something to cling on to, start to show resilience that has been missing from their game this season and dig in. They even look to make more swift counters than they had in the first half, as they sense that maybe their luck has turned. Saints find it harder to make good chances, Davis hitting a defender when good work from Cédric had given him a sight of goal. But most of Saints’ crossing seems to take on a more hopeful tinge, compared with the precision of the opening stages. Saints make two substitutions that raise their game. Wanyama has had another disappointing game and is replaced by Romeu. Juanmi is also given a chance in place of Tadić to try to rescue something from the game and between the pair of them it gives Saints a second wind. Juanmi is perhaps a bit unfortunate when a Saints break puts him away from a Davis pass and he forces a good save from Guzan. That gives the crowd a lift and Saints start to up the tempo. It brings its reward as JWP puts in a terrific corner which Romeu turns in from the same spot as Lescott earlier in the game - this was a slightly more difficult finish though, under pressure. Saints continue to push forward for a winner, but again get a let off when Cédric leaves a cross without realising that Westwood is lurking at the back post, luckily for Saints the finish is wild. The game becomes quite ragged and end-to-end, neither side looking particularly composed for a period, Romeu blazing a shot wide from the edge of the box. 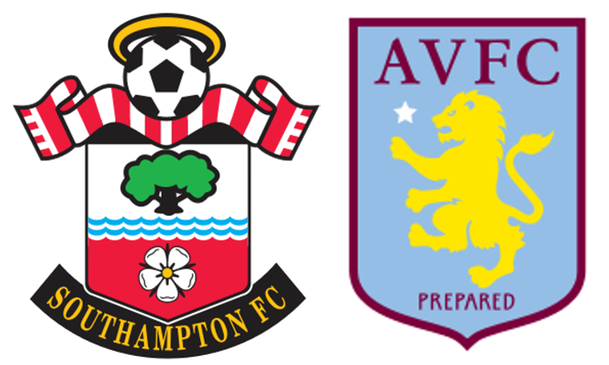 It’s Villa who are clinging on at the end, Guzan picking up a yellow card for time wasting at a goal kick, but Saints have never looked quite as potent as they did in the first few minutes of the game. Long has a shot from miles out into the side netting after 95 minutes, but Villa ultimately collect their first away point since August. A strange game - in many ways it was a really good performance, the way we got at Villa from the start was excellent and we certainly made enough openings to win easily. But coming off three defeats, we just didn’t punish Villa the way we would have done at our best. As time passed, we struggled to maintain our dominance, aside from a good spell when we got the equaliser. Defensive frailties of our own were apparent - aside from the poor Lescott goal, the Gestede and Westwood chances would have been gobbled up by top class sides. It was a great chance for 3 points with some tricky fixtures to come and it has to be considered a disappointment to only draw.